Learnt this Dish from my Bhabhi. When I used to work in Mumbai, not only my colleagues, my (Train) friends too just loved this dish. In a pan, heat about one and a half tablespoon oil, add Garlic, Red Chillies, chopped Onions and salt. Saute it well till onions turns light brown. Now add chopped Tomatoes and saute well. When Tomatoes become pulpy remove the pan from fire. After the ingredients cool down a bit, grind it to chutney consistency. For Seasoning - Heat 1/2 tablespoon oil in a pan, add urad dal, mustard seeds and curry leaves. Once the mustard seeds splutter, remove the pan from fire and add this seasoning to the Tomato Chutney. 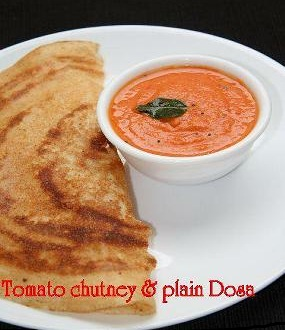 Enjoy this Chutney with Dosas, Idlis, Bread, Chapatis.